85% natural Acorelle Face & Body Bleach Cream bleaches easily all unwanted facial and body hair ! Sensitive skin friendly and ammonia-free, this bleaching cream combines sweet almond, argan and macadamia oils to soothe and protect skin against redness and irritation. Nicely fragranced, ACORELLE Bleach Cream comes along with a 98% natural Soothing Skincare rich in aloe vera and shea butter to comfort skin after bleaching skin after being bleached. 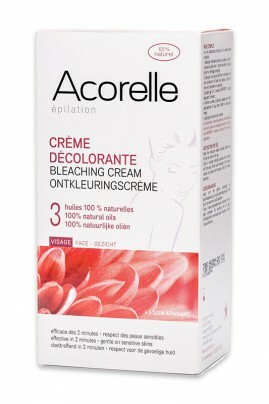 EASY AND CONVENIENT BLEACHING WITH ACORELLE HAIR BLEACH CREAM ! Before first use, make a safety test on a small part of the aera you wish to bleach to check skin tolerance. If no reaction occurs in the next 24h, you can proceed bleaching. 1. Mix gently into the wooden bowl the same amount of cream A and cream B homogeneously. Size the quantity according to the area to bleach. 2. Apply an even layer of the mixture on the area to bleach using the spatula, covering all of the hair. 3. For face : leave it for 5 to 10 minutes max, never exceed 10 minutes. 4. For body : leave it for 10 to 15 minutes max, never exceed 15 minutes. 5. Swipe off the cream using the spatula, rinse abundantly with clear water and dry the skin gently without rubbing. 6. Apply the Acorelle Soothing Skincare. Products can be used within 6 months after first opening. BLEACH CREAM ACORELLE IS EFFICIENT AND NICE TO USE WITHOUT AMMONIA ! AQUA (WATER), CETEARYL ALCOHOL, HYDROGEN PEROXIDE, GLYCERIN, CETEARYL ETHYLHEXANOATE, CETEARETH-12, DIPROPYLENE GLYCOL, PROPYLENE GLYCOL, PANTHENOL, ISOPROPYL MYRISTATE, BOSWELLIA SERRATA GUM, DISODIUM EDTA, PHOSPHORIC ACID, LACTIC ACID. AQUA (WATER), CETEARYL ALCOHOL, ETHANOLAMINE, GLYCERIN, CETEARYL ETHYLHEXANOATE, CETEARETH-12, ISOPROPYL MYRISTATE, ARGANIA SPINOSA KERNEL OIL, PRUNUS AMYGDALUS DULCIS (SWEET ALMOND) OIL, MACADAMIA INTEGRIFOLIA SEED OIL, PARFUM (FRAGRANCE), TOCOPHEROL. AQUA (WATER), ALOE BARBADENSIS LEAF JUICE, COCO-CAPRYLATE, POLYGLYCERYL-6 DISTEARATE, BUTYROSPERMUM PARKII (SHEA) BUTTER, GLYCERIN, CETYL ALCOHOL, PRUNUS AMYGDALUS DULCIS (SWEET ALMOND) OIL, CAPRYLIC/CAPRIC TRIGLYCERIDE, JOJOBA ESTERS, BOSWELLIA SERRATA GUM, XANTHAN GUM, STEARIC ACID, POLYGLYCERYL-3 BEESWAX, PARFUM (FRAGRANCE), SODIUM BENZOATE, POTASSIUM SORBATE, DIPROPYLENE GLYCOL, MYRISTIC ACID, PALMITIC ACID, CITRIC ACID, ARACHIDIC ACID, BENZYL SALICYLATE, CITRAL, LIMONENE, LINALOOL.